Please comment below with your votes, and please only vote once for one title! The top vote getter will get a special prize from me. I will be submitting all three of these to my editor, and if one makes the grade, there will be an even bigger prize! Vote by 11:59pm CST Thursday and I will announce the winner on Friday! Hello Chickens! Are you sick of winter? Because I am just about up to here with this weather business. At the moment I'm watching the rain pour down, which makes me happy, because perhaps some of this 68 freaking inches of snow we've had dumped on us will actually go away, but also makes me nervous, what with the whole flooding potential. Not to mention that the temp is supposed to drop again, and I'd prefer to keep the whole ice rink situation solidly in Sochi, thank you very much. At the moment? Its like living in a half melted margarita. With dirt in it. And a staggering amount of unattended to dog poop. C'mon people, pick up after your dogs! So far, so good, nothing scary happening in the basement, but I'm keeping fingers crossed for all of my friends and loved ones who live where the water systems can get overloaded. We've always been fortunate with our location, the basement here is a dry one. But you can bet we are in the process of installing drain tile and a sump pump, because we believe in better safe than soggy. We are still enjoying the heck out of the new central heating system, and loving the look of the place now that all the huge radiators are out of the house! You'd be absolutely shocked how much room is taken up by radiators. It feels like a whole new space. In other news, we are officially beginning to design the basement bathroom! This is enormously exciting, since it is the first time we are making decisions about how a room will actually look, as opposed to just the size and shape and function of a space. Its complicated, since while EVENTUALLY it will be "just a basement guest bathroom" for the foreseeable future it will become our master bath, so we are walking a fine line of doing something that isn't too insane, but will still be an upgrade for us when we temporarily move downstairs so they can work their way up! They say that with design, it is best to make one big initial decision and then let the rest follow from there. It could be a tub or a shower configuration, it could be a tile choice or color scheme. 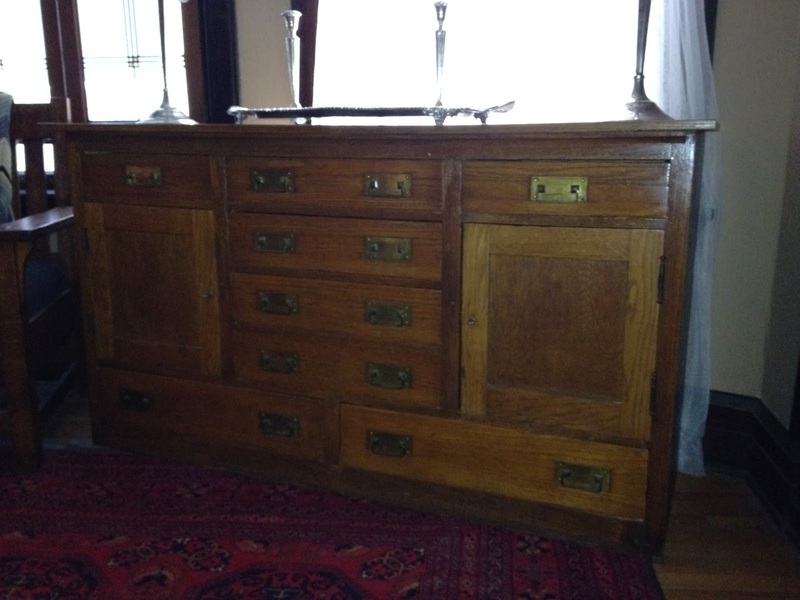 This is an arts and crafts buffet, circa 1930ish, with original brass hardware. And while it looks perfectly lovely in its temporary home in our dining room, we are very excited for it to have a future life...as the vanity in the bathroom! We will be removing the wooden top, installing an under-mounted 4 foot long trough sink with a stone countertop, and installing two wall-mounted faucets in antique brass to match the hardware. Charming Suitor and I love the idea of both of us being able to brush our teeth concurrently without either of us getting beaned by a flying elbow or accidentally spit upon, but neither of us really love the look of two side by side sinks. By doing one long shared sink with two independent faucets we will get the separate functionality we want, but with a more modern, cleaner look. We will only lose the top three drawers when the sink goes in, and a couple inches of the depth in the two cabinet sections, but this piece should provide plenty of storage for the bathroom, and we think it will make for a really cool look. If you are looking into bathroom remodel, especially in an older home, I strongly suggest you investigate your options of turning a piece of furniture into your vanity. You'll get a much more custom look, often for a lot less money than you might spend on new cabinetry. This piece we found locally on Craigslist for not much money (thank god it fit in CS's truck for schlepping it home! ), and the conversion is pretty simple, our contractors will take care of it for us, but they say that anyone with basic carpentry skills could accomplish it as a DIY. Now that we have committed to this design choice, we will focus on planning the rest of the bathroom to work with this piece and compliment it...stay tuned for more decisions as we make them! Finally, I know you have all been on pins and needles about my pantry dinner project. So the good news, at least for us, is that at least once a week I have indeed been concocting dinners out of what we have lying around. Unfortunately for you, the recipes are so similar to each other that it isn't worth giving you recipes. Since we are still working our way thru the endless supply of ground beef that comes when you purchase a quarter of a cow, the stewlike dishes all start with sautéed ground beef and onions, dumped in the slow cooker with some sort of grain or pasta, some sort of bean or lentil, a can of crushed tomatoes, a box of either beef or chicken stock, and whatever veggies happen to be lying around. Each version is a teeny bit different, so that is preventing us from getting too bored, but it isn't like I'm magically coming up with exciting new dining innovations. I wanted to, I thought I would, but I find that a lot of the ingredients I have socked away are much more suited to making sauces and such, and would require the purchase of new ingredients to make them sing, so for the moment, I'm just focused on clearing the decks a bit and whittling down the stores while the weather still calls for hearty bowls of what CS has taken to calling "Casseroles Without Borders". Hopefully when the weather improves and I've gotten the pantry and freezer down to more rational contents, I'll be able to focus more on new ideas. In the meantime, don't forget to help me find a title for my upcoming digital cookbook...details HERE. Winners Announced, and a New Epic Contest! For the rest of you, I hope you will buy a copy of this terrific book, maybe two....one for you and one for the person who begged you not to send that note to that crush. You can find it at your favorite local bookseller, or HERE. 2. I need a name for the cookbook. At the moment we are referring to it as Stacey Ballis' Big EBook of Yummy Deliciousness, which, you know, is god freaking awful. So I am looking for some titles with a similarly fun vibe, but less terribleness. I will pick the top few choices and put them up for a vote, and the top two vote getters will receive a fun package of cooking gadgets. If my editor picks any one of your titles for the actual book, not only will you get a signed copy of Out To Lunch, but I will use your name (or the name of your choosing) for a character in my next book. (to be clear, not in Recipe for Disaster, which is finished, but the NEXT one which I haven't started writing yet because of the cookbook thing). So, comment below with recipes I need to include, AND possible cookbook titles between now and 11:59 PM Monday Feb. 24, and I will open voting on Feb. 25. Thanks again to the fabulous Pamela Ribon for coming to visit and being so generous with the signed books! Hello Chickens! Are you surviving your winter? Here in Chicago, where we have officially gotten more inches of snow than your Polymath is tall, I have just one thing to say. In other good news, I have finished the manuscript of my next novel, Recipe for Disaster, and sent it off to my editor so that she can help me make it into a book. You will have it in your hot little hands in March of 2015! I know this seems like a long time, but trust me, you want it to take this long. The only way to make it shorter would be for you to have to read the rough draft, which Charming Suitor can attest is an exercise in ignoring bad grammar, spelling errors, redundancy, and other egregious plot blips that take you out of the story and make it annoying. Let me just say that when I gratefully received the advanced copy of this book I was just a few short weeks away from deadline, and on total lockdown. But I wanted to take a quick peek at just the first chapter, and I was hooked. One of those delicious reads you literally cannot put down. And for anyone who ever put themselves out there on a limb for love, you will see yourself in this hilarious and often poignant book. Pamela fearlessly shares not only her stories of love unrequited, or badly requited, or totally imagined, she also shares the notes and letters she wrote to the objects of her affections in all of their mortifying glory. The result is a book that will make you remember your past with awkward fondness, and will without a doubt make you a fan of Pamela's work for life. There is an excerpt she is sharing with us below. I know you won't want to wait to win your copy to keep reading, so you can buy it HERE. While you are there, check out her other books, which are equally wonderful. 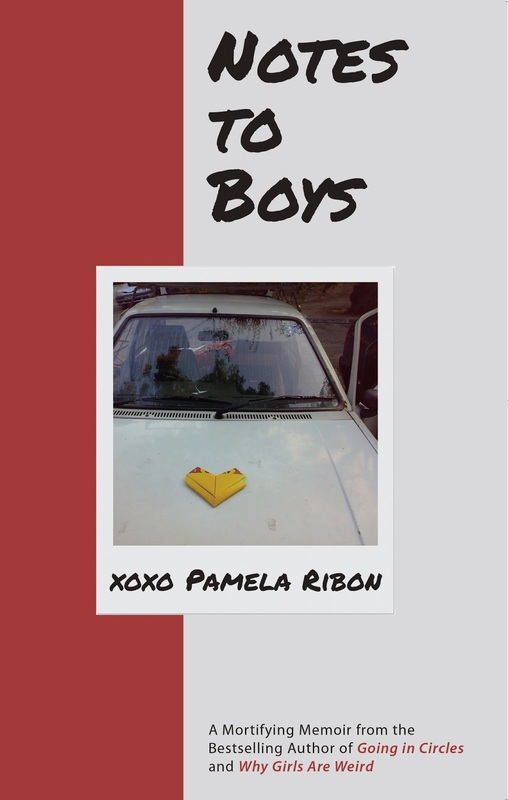 Pam has graciously agreed to give away 10 signed copies of Notes to Boys, to enter, just comment below, preferably sharing the most embarrassing thing you ever did for love by 11:59PM Thursday night, and I will announce winners (and a fairly epic contest) Friday. In the meantime, I hand over the page to Pamela! Let’s start with one of my first ridiculous moments in love: the night I forced my crush to watch Broadcast News with me. I suppose technically he watched it while I watched him watching it—my eyes wide and mouth ready for the kiss I knew he’d give me as soon as he figured out that I was Albert Brooks and he…he…was my Holly Hunter. This is where I should probably tell you that I was thirteen years old. But my heart knew we were destined to be. Even the chance to watch this romantic comedy together was a miracle that I assumed was part of our destiny—I had just moved away, several states over, to a small, rural town in Texas, and for reasons I’ll never understand, both of our parents allowed this visit. He flew to my house. On a plane. He arrived at baggage claim wearing a navy blue Late Night with David Letterman T-shirt. I know you don’t need to know that, but you should know that I know that because it speaks to how important this was to me. We only had a couple of days together—mere hours! This meant I needed him to make a move and make it soon if we were going to be young lovers running through the streets. So I took him to the most romantic place I knew. I took him to Six Flags. I’d always wanted to be that tanned and sweaty girl in an endless line for a roller coaster. She’s wearing a flimsy spaghetti-strap top and tiny shorts as she sits on the handrail that divides the lines into rigid sections. She’s chewing gum, or maybe just letting it stretch across her tongue as she rests her dewy cheek against the strong, muscled shoulder of her boyfriend. I wanted one of those middle-distance staring, metal band T-shirt wearing, floppy-haired, unfortunate-skinned boyfriends. He’s the one standing in the space between her parted knees. He’s the one holding her weary body up as they wait for a thrill ride. I craved that moment with a boy, our sweat-soaked love the only thing keeping us from sudden heatstroke. Why was I the only pre-teen ready for a serious, adult relationship? When would someone want to talk with me at a coffee shop about Salinger and Kids in the Hall sketches? When would I find my true Holly Hunter? The real tragedy is that nobody ever pulled me aside to gently inform me that some feelings I should keep inside, that not everybody deserves my truth. Or at least so much of my truth. Instead I was all alone and determined to find the one boy who wanted all of it, all of me, who loved my words first, my body second. My words first, my brain second, my bookshelves third, and then my body. No—my mixtapes! Then my body. Now that you can imagine the type of girl I was as I entered my very heady, super hormonal teen years, you should also know that I had a lot of time on my hands and access to a whole lot of paper. This was before the Internet (I would normally add a “thankfully” here, but since I’m not just uploading the contents of what I wrote, I’m going the extra step to publishing them, I have no reason to be grateful for anything, and nobody to blame but myself), so there was nothing to stop me that probably keeps other teens in check these days (i.e. bullying, public mockery). I spent many, many, way too many years writing love letters, poems, stories. I wrote obsessively. Compulsively. Constantly. And for the most part, I delivered those pages straight to their intended target. But not before I saved myself a copy. It’s likely I kept the first drafts and hand delivered the more refined, less scribbly revision. All I know is I have boxes of notebooks and folders filled with evidence that I spent the majority of my teen years being an accidental stalker. This is where you probably ask, But why do you still have all those boxes of notebooks and folders? It’s a valid question. The only answer I can give you is, it’s not hoarding if it’s research. I gift that statement to the other human magpies in the world, the ones who can’t bear to toss things that hold even the slightest sentimental value. As someone who has three large bowls filled with wine corks, I understand. For those of you who still have boxes stuffed with high school theatre T-shirts or every issue of Sassy magazine, I carry your heart. I carry your heart in my heart. And I put that heart in a drawer with a whole lot of other hearts and some keychains with bank logos on them and some photo booth strips I keep planning on framing one day in a cute way and an Altoids tin of three-hole punch brads because I have a compulsion to save that’s fueled by the fear of becoming meaningless. The first time I shared these letters and stories with my husband, we were still only dating at the time. I opened my gigantic green folder of past love and began reading one of the letters to him in an embarrassed, Gosh, remember when you used to be like this? sort of way. I was a few sentences in when he closed his eyes. “Please stop,” he said, holding up his hand—palm out, as if he needed to shield his face from any further harm. I was still quite flattered.